Roman (c. 75 - 175) Trumpet brooch (Mackreth 2011, Chap 5., Part 1, Group 1.3b2, Plate 82): The bow head is a drop-shape with abraded edges. On the reverse there is an incomplete, perforated vertical lug. The spring and pin are missing. The bow leads from the centre of the head and is sub-triangular in section and in profile is an inverted sub L-shape. At the apex there is a series of horizontal grooves and ridges of varying thicknesses. The lower portion of the bow tapers to a blunt foot. This portion of the bow is undecorated and on the reverse there is a solid catchplate. The brooch has a mottled mid brown-green patina. It weighs 5.53g, and measures 8.58mm wide across the bow head and 46.45mm long. 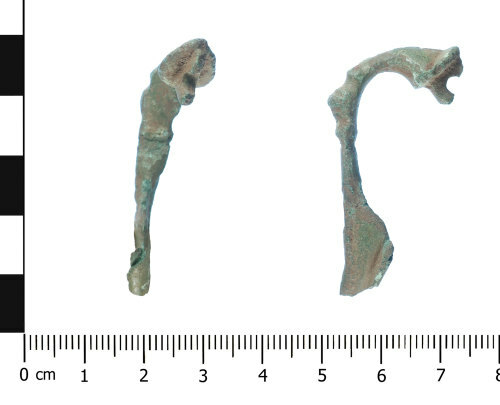 The brooch is a Trumpet-headed type, possibly a Group D type but is less decorated than the usual examples, dating to the late 1st to mid 2nd century (Bayley and Butcher, 2004; 163). Mackreth classifies it as Chap 5., Part 1, Group 1.3b2. No. 5217 on Plate 82 is very similar.